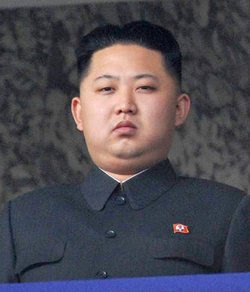 Kim Jong Il is dead. His son, Kim Jong Un is taking over. The North Korean regime is run, essentially, by a military oligarchy. Generals and other high-ranking officials tend to garner strong loyalties by their troops, and thus have the power to enforce their wishes. It is thus possible for military leaders to try to stage a coup or otherwise disrupt the government if they are unhappy (we've discussed this before after the Cheoan incident). The danger in the death of Kim Jong Il is that North Korea's military leadership may not be happy with Kim Jong Un as the new leader of the country. He is young, untested, and apparently a bit unsocial and reclusive. In any such transition (even if not to a leader that is particularly inept), the temporary weakness of loyalty and stability could prompt a move by one of these military leaders. 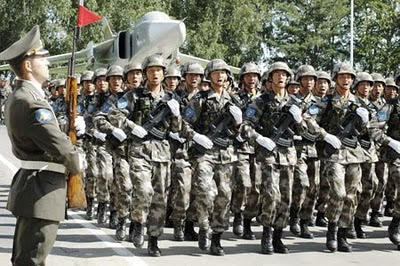 China: Like in the Cheoan incident, China will be backing Kim in order to preserve stability. Its very strong, quick backing shows that it will put its weight behind Kim in order to deter actors within North Korea from attempting a coup. A war in North Korea would mean a major refugee influx into China, which it is not at all prepared to handle. 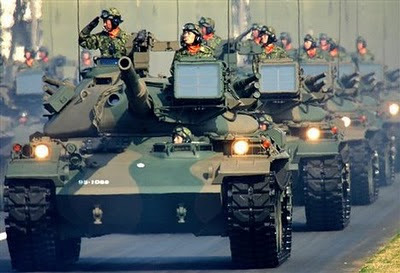 Japan & South Korea: Japan and South Korea are showing some warmth in working to keep the region stable, as well. Japan is working with China directly, highlighted by a recent high-level diplomatic visit. Japan risks being at the wrong end of ballistic missiles that North Korea has aimed at the country that could be taken over by military factions even less interested in stability than Kim was (again, see the Cheoan incident). South Korea actually sent mourners to North Korea to express regrets for Kim Jong Il's death. The move is designed to start off on the right foot with the new regime and express an interest in potentially working together. South Korea not only faces the refugee threat that North Korea does, but also potentially a direct invasion if the wrong military leaders take power. It also, long-term, seeks unification with the North, and may be testing the waters to see how Kim Jong Un responds. Russia: Russia has been quietly supportive. It is currently looking inward at its own protests, and to its WTO ascension, and may partially be distracted. Additionally, it does not want to be too closely associated with North Korea (it gets little out of its relationship with North Korea other than North Korea can prove a useful distraction against the United States and its allies), but similarly wants stability on the peninsula. United States: The United States sees the transition as an opportunity to resume the six-party talks aimed at dismantling the North Korean nuclear weapons program. Expect the United States to show the most aggressive posture of any of the six-party members, but it will take some time before Japan and South Korea are ready to negotiate hard with Kim. That said, the United States making its intentions clear early on can slowly and steadily build momentum. Kim Jong Un was placed in the seat of successor very quickly, after Kim Jong Il's older two sons became politically unpopular by various means--for example, Jong Un is a 4-star general despite no military experience at all. The posturing is meant, in some ways, to project to the world that North Korea is united in its choice for successor. Some factions may be looking for an opportunity to unseat Jong Un, but so far it looks like enough military leaders of the country are behind him to give him legitimacy, and that legitimacy will grow if he plays his cards well with the great powers around him--and they'll be looking to support him unless he turns out particularly rotten. I apologise for my long absence from the blog. I've been busy, but I've also been holding back and feeling out the European situation before I wanted to say anything definitive about it. As the European Debt Crisis worsens, we are starting to see the fault lines in the "Blocanization" of Europe grow wider and deeper. The core EU is torn between total control of its periphery, and jettisoning it completely. The former Soviet bloc countries continue to huddle together, waiting to ride out the eurozone storm and hold the Russians at bay when they come to capitalize on the fracturing of the Eurozone. Turkey's previous desperate love affair with the EU has become nearly a joke. In the end, we're seeing Europe, as a concept, fall apart. The EU still exists, but it may dissolve in the next few years. If Greece or Italy leave, it will set a precedent that countries like the Czech republic, Poland, and the United Kingdom (all of whom have grown massively Euroskeptical) may take on and jump ship. This will happen, without a doubt, before any of these countries allow themselves to be pulled down by the Eurozone's debt crisis. Even if these countries don't leave, they'll weaken the EU and make sure they are not as dependent on the fiscal responsibility of periphery countries in the region. Nationalism is coming back in Europe, and with ferocity. This nationalism, which many thought was being eroded away by Pan-Europeanism, will lead to European countries acting, once again, as independent entities, rather than a united force. Geopolitically, it eliminates Europe from contestants for the role of 21st century hegemony. Despite its national pessimism, the United States is once again the front-runner--it remains the center of gravity of world trade and commands the seas. A growing Russia may be able to challenge the United States over the next 50 years. China continues to focus inwardly, and risks its own end similar to the "Japanese Miracle" if it cannot navigate its way out of the toughest bubbles in world history. Look for surges in activity and influence-building from all three of these nations in the next decade or so, as they try to feel out what the new geopolitical system is going to look like. Today we continue our 5-part series on the Blocanization of Europe by discussing the changes that will happen to the UK, US, Canada, and Iceland as the Continent splits into blocs. The Atlantics are largely a classic story, and largely a bloc that has existed since the beginning of the second World War. The question of The Atlantics bloc has always been about just how much the Atlantic powers get distracted from each other. To be clear, the Atlantics consist, fundamentally, of the United States, Canada, and the United Kingdom--I've (controversially, I supppose) tacked on Iceland due to perceived mutual benefit and a few historical interactions. The United States, Canada, & United Kingdom have the exact same interest on the Continent: prevent any power from amassing enough wealth, power, and influence that it could project that power out of the Continent. For the UK, this threat is more immediate. But for the US & Canada, the fall of the UK to a Continental power would spell long-term disaster (if one consolidated the Continent from Moscow to London, its economy would be a bit larger than that of Washington & Ottowa combined). We saw this during the first and second World Wars, as well as the Cold War--the US, Canada, and UK have a "special relationship" not despite geopolitics but because of it (which generally makes such a relationship more reliable and less fickle). It will continue to be so. So why are we even discussing this? Trends looked, briefly, like they would turn awry for the North America / UK relationship in the 2000s, while Europe was upset with the US over Iraq and wildly enamored with its own experiment: a politically strong European Union. It appeared as if the UK had turned its attention towards the Continent, and would actually embrace a unified Continental power. But this was never to be. The UK managed to sneak in a Eurozone deal in which it had the option of keeping the Pound as a currency for as long as it wanted (it will keep the Pound, for sure). The UK has lobbied against a stronger European military or foreign policy cooperation, preferring to limit its involvement to free trade, and a few domestically popular legislative concepts. The UK has been skeptical of its involvement with the European Union, and has now grown exceptionally so. Unlike the United States, the European Union would not go to war with itself to maintain its cohesion--there is too much Nationalism at the level of each country, and the EU's tendrils of cohesion are already too weak, and getting weaker. As the UK pulls away, the European Union will do little to stop it. The United Kingdom is very worried about recent Franco-Russo-German cooperation in military & economic matters. In the 19th and 20th centuries, it was usually 2 of these powers versus the other, and the United Kingdom always sided with the underdog to prevent Continental consolidation. But the UK shudders to think of facing all three at once, and will turn increasingly towards the US for support if this cooperative trend continues on the Continent among its major powers. And of Iceland? Iceland has no military at all, and depends on NATO for protection. But if NATO's cohesion weakens (which it will), it will need to cling to one of the Blocs for security. Why the Atlantics, and why not the Baltics? As we'll discuss in our final installment on The Blocanization of Europe, the Baltics are too preoccupied with defending their borders from Russia to reach out to protect Iceland. The US, UK, and Canada will pick up the slack--the US rarely backs off an opportunity to have a forward base of operations in exchange for military protection, and will take the opportunity here as Russia's power grows (as much as Iceland may hold its nose during the deal). Ultimately, the US, Canada, and UK will work together to play European powers off each other and try to keep the continent divided. They will back the underdog (in this case, the Visegrad 4) against powers like Russia & Germany that are looking to expand their influence across larger swaths of the Continent. North American / UK cooperation will only grow into the future as the Atlantics return to their old strategy of managing Europe at an arms length. Today we continue our 5-part series on the Blocanization of Europe by skipping ahead to the EU Periphery, as it's currently of great interest to state leaders and armchair political scientists, alike. Rather than talking borders and weaponry, we'll be talking about money. It's just as important. 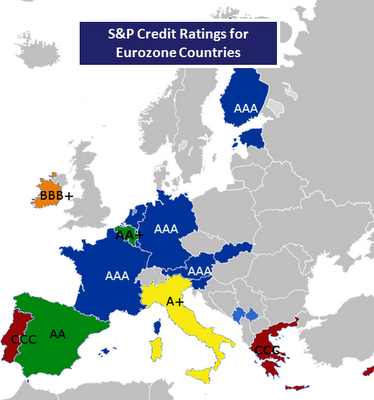 Standard & Poor's have cut the credit ratings of both Portugal and Greece to CCC, tied with a few other countries as the worst credit ratings in the world (see here for S&P credit ratings definitions). These, along with mediocre credit ratings for Italy, Spain, Belgium, and Ireland, put the Eurozone concept (and European unity in general) at major risk (see Wikipedia for an elaborated explanation of how the Eurozone and European Union differ). The periphery states have become an albatross to the "core" EU states (for the "albatross" reference, please see Rime of the Ancient Mariner). Portugal and Greece have both already received bailouts, and Greece is likely to accept another in exchange for a modest austerity plan. Despite these bailouts, S&P (as well as Moody's, and other credit rating agencies) have tanked most of the periphery states in credit rating--indicating their likelihood to be able to pay back credit on time. 1) Chronically weak periphery states will mean that the Euro won't overtake the US Dollar as the world's dominant currency. It will mean less influence for France and Germany on the world stage than they would otherwise have. 2) France and Germany may become tired of bailouts and allow defaults. The German & French taxpayers are subsidizing Portuguese & Greek deficits, and are likely to lose patience with it. If this occurs, Greece or Portugal may default, weakening both EU strength and solidarity. 3) France and Germany are looking for more financially stable partners. Generally, they are turning towards Russia, with little debt and significant earning potential (as well as few entitlement/welfare programs). Germany and France are likely to see much of the EU as a financial burden (rather than boon), and will focus on finding financial success elsewhere. This will drive Germany, France, and Russia closer together. Such a friendship has consequences beyond the EU Periphery--it will change the course of NATO, and US/UK strategy for a time to come (the latter of which will be discussed in our Atlantics section). 4) The continued struggle of EU periphery countries makes Eurozone obligations less attractive to potential members. Eastern Europe (technically obligated to join the Eurozone at some point) and the UK (with an option to join the Eurozone) are likely to balk at the idea of the financial burdens associated with Eurozone membership, and may try to find a way out. Those who have read our previous posts are likely to see how this is a rather impressive compounding factor with other forces that are forcing Europe into blocs. The EU periphery is not going to become a bloc, perse--they are too weak to help each other--but the EU "Core" and V4 are likely to abandon the periphery at some point in hopes of better pastures elsewhere... and out of a fear of going down with the Eurozone ship, should it sink. The formation of the Visegrad 4 Battle Group seems to have awakened the United States to its own relative distraction from Eastern European allies. Poland, which has been asking for American "boots on the ground" (if for no other reason than as a symbolic stand that the United States will defend Poland from Russia), finally extracted a pledge from President Obama, who will be visiting Saturday. The US will be placing aircraft and trainers in a Polish base to beef up the Polish air force. The president has also assured the US commitment to the NATO precept: mutual defense. The fact that President Obama needed to make this reassurance to an ally that was staunchly secure during the Bush years is a sign that the US has begun to recognize its poor attention to the area. It's also a sign that the V4 is being taken very seriously, and immediately. Today, we'll be discussing the Visegrad 4, if for no other reason than we find them the most interesting and most potentially game-changing bloc of Europe. The formation of a Visegrad 4 "Battle Group" was the original even that prompted our thinking about the blocanization of Europe; it is both a symptom of and (will be) an emerging cause of declining European solidarity. Ultimately, NATO's inability to completely defeat the Russian Bloc (by failing to integrate Ukraine and Georgia into NATO) meant that European security could not be completely ignored; that, combined with NATO's attention locked in the Middle East (and thus not on Eastern European security: the United States has pledged only a single army brigrade to the defense of the Visegrad 4) have led to a serious security crisis for the V4. With a strong Russia and a weakened will by NATO to commit to Eastern Europe's defense, the Visegrad 4 had to take matters into its own hands. The Visegrad 4 battle group certainly projects a strong regional commitment to a unified defense of the plains from Russia; perhaps more importantly, it will have a significant material impact on the region's ability to defend itself. The Battle Group will allow each country to streamline its military to adopt regional command and control; sharing resources will allow each country to reduce redundancy and redirect freed resources to extra firepower or new specialization. Shared intelligence will lead to greater regional awareness, and thus better response times and effectiveness. Most importantly, the Battle Group means that the V4's entire military force could potentially focus on a single area quickly (both due to bureaucratic reductions and effective regional planning on troop mobilization and transportation), thus making it much harder to "pick off" individual countries in the region. Historically, such "picking-off" has been a key strategy for both Germany and Russia in consolidating power in the region (Germany and the Soviet Union were both successful in such a strategy in the 20th century); the V4's Battle Group nearly guarantees such a strategy will not work, as long as the will to support it remains (which it should into the medium-term future). Romania and Bulgaria similarly recall the harsh rule of the Soviet Union, and wish to avoid any similar arrangement. They joined the EU and NATO in order to guarantee security against any repeat incidents, but the relative aloofness of NATO and a breakdown of confidence in the EU as a supranational structure is likely to push these two countries towards the next-best alternative: the V4. Neither Romania nor Bulgaria has yet shown commitment to join the V4; in particular, Hungary and Romania have had regional disputes over territory and mutual security. But, if Russia's regional assertiveness continues to grow, these two countries will need to seek shelter. There is potential, especially in Bulgaria, to fall into Turkey's sphere, but a European rejection of Turkey's bid for EU membership is likely to push it towards the Arab region (where it already seem sto be facing). The Visegrad 4's strengthening has implications beyond its own interactions internally and with Russia. Eastern Europe is currently the EU's most dynamic economic region, with highest yearly GDP growth on the continent. While the region is still economically troubled, its structural advantages set it up to continue to grow over the next decade. If the EU's financial strength continues to weaken, the V4 may become the economic stronghold of the continent--and its influence over the region will grow as many countries come to depend on its growing economic strength. Practically-speaking, the US and UK will not abandon the V4 entirely: they see the V4 region (in particular) as a stronghold against an emerging Russia, and will support it when times become dire enough. But Middle Eastern distractions have turned the attention of the V4's major allies, and this group will wisely remember not to depend too heavily upon Western allied support against Russia--it has failed multiple times in the 20th century (during the German invasion of Poland, the Hungarian and Czech revolts against the Soviet Union), and the Visegrad 4 will not sit by to allow another such failure. Expect, in the future, for the Visegrad 4 to grow increasingly strong and assertive as it finds its center of gravity. The region faces many risks to its long-term security, but it is likely to have the influence and weight, when the situation grows "dire," to man its own front lines and call upon the help it will need from the US and UK. I'll keep this one quick. I've been doing some thinking about how Europe has been changing in the past decade, especially with the military rise of the Visegrad 4. It has been a dramatic change indeed. A large portion of my next few posts will be focused on this series: The Blocanization of Europe. In short: the vision of a single unified Europe is beginning to show the signs of fray -- a "blocanization" of the continent is beginning, based on natural lines of national interest and security. In particular, as we see NATO's commitment to European Security weaken, and the financial integrity of the European Union shaken, the ability to depend on the hope of a strong, unified Europe is diminishing. We'll be focusing on the reasons for this, and the new blocs emerging--and what each means. 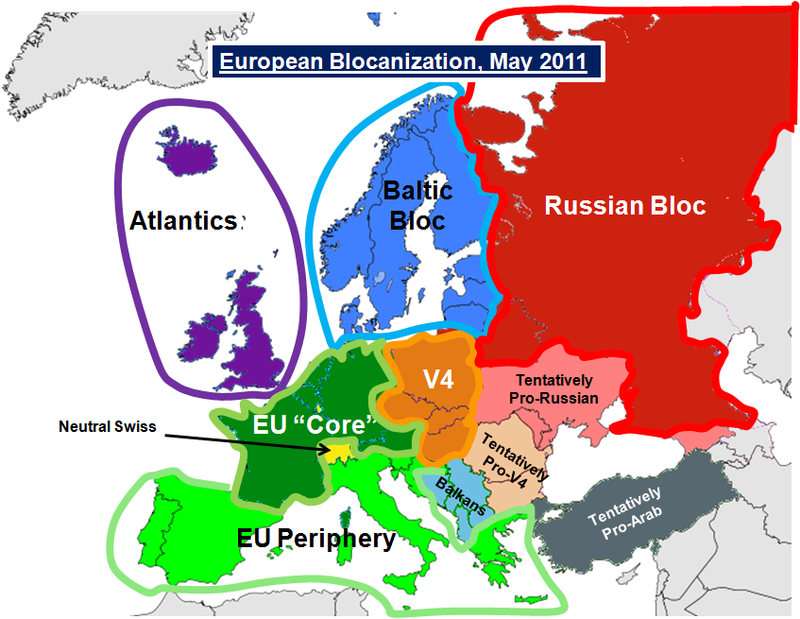 As a teaser, I've attached a map of these blocs, built on my current understanding of the geopolitical makeup of the new Europe. Via: VA Home Loans, a company trying to sell you stuff, but it's a pretty good image, nonetheless. Bin Laden's death at the hands of American special forces sheds insight in two ways: learnings for the present, and implications for the future. 1) Arab Muslim Sentiment: There has been little Arab outrage over the death of Bin Laden, or any other signs of upswollen support for the Al Qaeda movement. It's a sign that Al Qaeda has low popularity among the Arab Muslim world, which will cause it to be increasingly marginalized: "grassroots" movements like Al Qaeda rely on some popular support for both resources and sanctuary. It's a sign that Al Qaeda's message of global Jihad is falling on relatively deaf ears... and a sign that its ability to commit high-casualty transnational attacks is severely limited (as much as from pressure in Afghanistan as from losing the "propaganda war" for the hearts/minds of the Arab Muslim population). 2) Pakistan: one must be asking, "How did Bin Laden make it for nearly 10 years in Pakistan without being caught?" He wasn't even deep in a remote mountain area; he was in a relatively safe and populated town near Islamabad (people less than 1km away were tweeting about the noise from the American helicopters). Is Pakistan's intelligence service lacking in competence, or loyalty? Did Bin Laden have inside help? The US will need to figure this out. 1) Al Qaeda Leadership: Damaged some, though not necessarily in any serious operational capacity. Al Qaeda became a relatively independent "cell" network that did sometimes interact with central leadership, but not terribly often. Tactics are generally left to the cells, and strategic (even if not "visionary") leadership is currently delegated to regional authorities (like Al Qaeda of the Arabian Penninsula, Al Qaeda of the Islamic Maghreb, etc). Visionary leadership may well end up being lacking for Al Qaeda, but it may have been lacking for some time now. Bin Laden's grainy audio messages to go bomb this country or that country have largely failed to inspire any results, even if a few extremists were inspired to try. 2) The ground situation in Afghanistan: Little to no effect. Al Qaeda has been driven into Pakistan, and NATO is currently fighting a nationalist Islamist movement (the Taliban) rather than a transnationalist movement. The Taliban are certainly "bad guys" in the Western moral sense (in a much more clearly morally outrageous way than, say, the Viet Cong), but don't answer to Bin Laden and largely don't support his views of transnationalist Jihad. The Afghanistan "ground" situation won't change--the US hasn't beheaded the Taliban's leadership. 3) US Strategy: Ultimately, the signs are generally pointing to the fact that we may be slow to accept: that Al Qaeda, while still technically "in existence," is largely eliminated as a threat to the US. Other Islamist networks exist (in Algeria, in Yemen, in Saudi Arabia), but they have little traction to go transnational. Not because of Bin Laden's death, but based on leading indicators from the response worldwide to Bin Laden's death, it may be increasingly clear: the War on Terror is won. Transnational terror movements are fractured and unpopular; the Arab world is more concerned with nationalism and democratic reform than it is with beating back the spread of Western culture through jihad. Not to say there aren't many, many problems remaining in the Middle East. The US cannot ignore the region, but it can largely move towards a state where it is no longer burning its resources--and losing its sons--to the region. Never let it be said that Foggofwar doesn't hold itself accountable to its predictions. Let's go back and see how we did. For now, we won't cover everything--only the interesting ones. Libya: Certainly the most interesting case, Libya would give Foggofwar the excuse of "intervention by the world's most powerful military alliance." 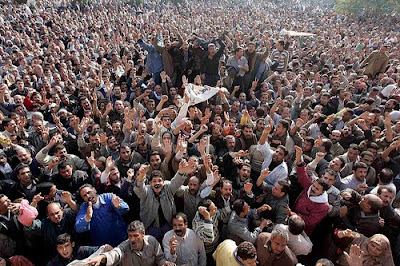 Ironically, we may not even need this prediction: Protests have still not reached Tripoli, and the Rebel/NATO alliance seems to be showing a serious inability to mount an assault across the long stretch of desert, and thus won't overthrow the Gaddafi regime: the West will lose interest before Gaddafi loses will or military capability. As Predicted. Morocco and Jordan: Protests here have died down largely due to reforms enacted by the governments that have given protesters what they wanted. As Predicted. Syria: Protests continue to rock the country, despite (or because of) Abbas' crackdowns. Abbas has the ability to keep a lid on the populous through serious security and political liberty reforms, which he may want to do in order to court the West, anyway. But Abbas has infuriated his country and squandered a strong, loyal security establishment. Increased Risk. Yemen: Rumors fly that the Yemenese president is working with Saudi and US allies to transition out of government... and out of the country. It's been a surprisingly long, sustained fight, but it looks like this current regime is on its way out. As Predicted. Bahrain: Bahrain has fallen out of the news sphere as of late, as the active unrest has stopped. Interestingly, the sustained crackdown continues, trying to marginalize the supporters of the protests. The regime is safe--for now. But the Shiite majority of the country has been alienated completely. Long-term, the regime will continue to face risk. As Predicted. Briefly speaking, no other country has surprised us yet in the magnitude of risk or, more importantly, in regime change. Overall, we've done pretty well so far. But we're happy to be proven wrong if things change. "All necessary measures" is likely a deliberately vague clause, allowing the West to justify (at least to itself) nearly any military action, while abiding by its post-Iraq rule-following sensibilities. Of course, the protection of civilians is a political mask over the true intent: regime change in Libya. As much as the Rebels are a bit of an unknown factor (and some of them are clearly Islamist), the West is quite tired of Gaddafi. The implications are numerous and highly variable. The West certainly hopes that its pro-Rebel action will endear it to the new anti-establishment movements and regimes that seem to be sweeping the Middle East. The West gets to claim "we helped without occupying!" when the new governments of the Middle East start making serious decisions. The fact that the Rebels asked consistently for Western help is a good sign that the PR has the potential to be good. That said, the Arab league is condemning the ground strikes, saying that the West has already gone past its mandate of protecting civilians. Indeed, the "protecting civilians" focus of the UN resolution may be a political crutch to real action. The Arab League, moving towards a popular/ democratic rhetoric, is worried that the air strikes will lead to non-insignificant civilian casualties; these governments thus do not want to be perceived as supporting more Western action in the Middle East that seems to damage Arab/Muslim people. The two questions as to the PR outcome will be the # of civilian casualties and the outcome of the campaign. More casualties will be tolerated in the short-term if Gaddafi's brutal regime is removed and replaced by something more friendly, but only if the front-line action is driven by the Rebels themselves. The West will need to keep some of its guns in check in order to avoid looking less like humanitarians and more like imperialists. Part of the major risk is scope creep, though it depends on the country. The United States has already committed to take a back seat after the Suppression of Enemy Air Defenses (SEAD) campaign ends, allowing countries like France and Italy to take over enforcing the no-fly zone and preventing ground forces from entering Benghazi en masse. That said, the risk is creating a stalemate, in which a withdrawal of air forces will allow Gaddafi to succeed, but an endless no-fly zone campaign might quickly frustrate both domestic European opinion and Middle East opinion. 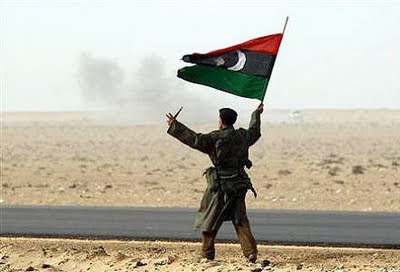 To break that stalemate and seriously cripple Gaddafi's forces (thus giving the rebels the advantage) will require action beyond the original mandate, though this can often be done with enough discretion that only minor objections will be thrown up. The West's goal here may be to make sure a friendly country, probably Egypt, is committed to supporting the rebels and making sure they can be rearmed, fed, and regrouped during the air campaign, such that they can make a sustained push west towards Tripoli when the initial SEAD campaign ends; Western forces are likely to be able to provide key intelligence to help the Rebels find isolated pro-Gaddafi units and overtake them quickly and decisively, which would further arm the rebels with artillery and armor. Likely military outcomes here are either a stalemate or a rebel victory. Gaddafi will struggle to get the forces he needs into Benghazi (and struggle to control them well enough to effectively occupy key population centers). As a default, military units are now hiding in heavily populated areas, though if they're otherwise paralyzed, it may give Rebel forces there an opportunity to harass the units into a state of unpreparedness for a more sustained Rebel counter-attack. While a Rebel victory is possible, it's also unlikely. The Rebels lack military leadership, and (unlike Yemen or Egypt) have not had major elements of the armed forces defect and turn their guns against the leadership. 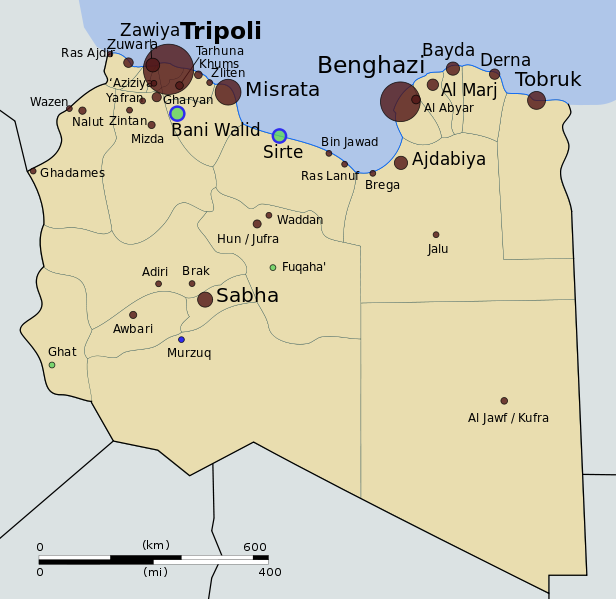 Until that happens, the Rebels would have to completely knock out the sizable Libyan army in order to claim victory over Tripoli. If the stalemate persists, the Rebels are likely to keep their alternative government in the east, and a de facto split of Libya would occur. The Benghazi government could garner international support; especially from Egypt (which would want influence over the large oil reserves in that area). but whether the Rebels win or not, the big question of its political makeup remains a major concern for the West. Clearly, the Rebels are anti-despotic, but what else? Libya had a brutal campaign against extremist Islam for some time--how strong are these influences in the Rebel group? Do the Rebels desire a secular state? Will it be Western-friendly? These are all questions left unanswered, and will largely determine the amount of sustained Western support for the government. Perhaps most interesting is that the biggest benefit the West is likely to get is its own internal sense of dignity and goodwill. With US-led operations in the last 10 years going militarily poorly and morally questionably, there have been a lot of bad feelings and aimlessness among the West, even with respect to itself. The West's strategic direction is confused and frustrated (especially as Russia seems to be running circles around NATO's internal conflicts). If Libya goes well, the West can achieve a "feel-good" victory like it had in the early 1990s, and a renewed confidence in its ability to be an effective and relatively-welcomed police force. Western military cohesion will not be that of the early 1990s, but it may improve. Specifically, the US will have an opportunity to act in an effective support role, both improving relations with Europe (by allowing Europe to lead the operation that's most relevant to its immediate periphery), and setting up a system in which the US can limit its engagement. The US has far and away the best logistical/transport capacity and control, as well as the best battlefield intelligence. These two factors make it a perfect candidate to support other Western nations' campaigns against less impressive forces, and the US can benefit significantly by setting up alliances in which it maintains that role.